After weeks of wrenching and filming, our Honda CB550F is back together. 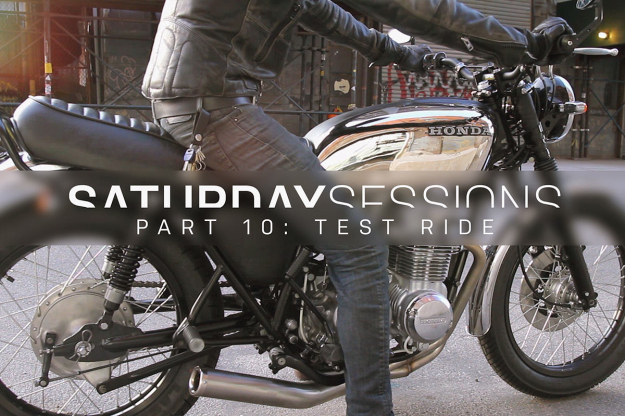 The hard work at E3 Motorcycles has paid off—and it’s time for that critical first test ride. There are still a couple of items that need attention before Browning can declare victory and hand the bike back to its owner, the New York agency Woods Witt Dealy. “The carbs will be coming off one more time so we can dial in the jetting—it’s running rich at the moment.” After the bike has been properly broken in, it’ll go back on the lift for the initial oil change, a compression test, a torque value check, and a final round of tuning. Everything you’ve seen in the Saturday Sessions series has been shot and released in real time, warts and all. “Some items worked out exactly as planned. Some exceeded our expectations. And some took way longer than they should have, due to set backs and delays. Pretty much par for the course for most build projects,” says Browning. Many thanks to everyone who watched the video series and contributed to the discussion. Hit play to enjoy the final episode.